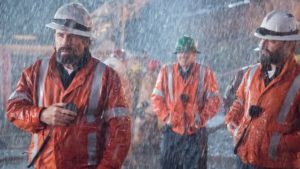 Braving dangerously dizzying heights, the unsung heroes known as electrical linemen, who are dedicated to keeping the populace safe, must face a deadly storm as it heads straight for their Texas town in the action-thriller Life on the Line. As a huge electrical storm sweeps towards Texas, lineman Beau (John Travolta, From Paris With Love) is haunted by memories of his brother’s death by lightning years earlier. Working hundreds of feet in the air on wires carrying as much as 500,000 volts of electricity, Beau and team race to replace miles of power cables before the tempest strikes. Also starring Kate Bosworth (Straw Dogs), Devon Sawa (The Exorcism of Molly Hartley) and Sharon Stone ($5 A Day), the R-rated film is directed by David Hackl (Into the Grizzly Maze).